On this date I flew for the first time with wider deturbulators. 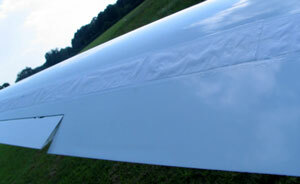 From the wing roots to the inboard ends of the airbrakes, they were widened by a factor of three (from 2 to 6 inches). 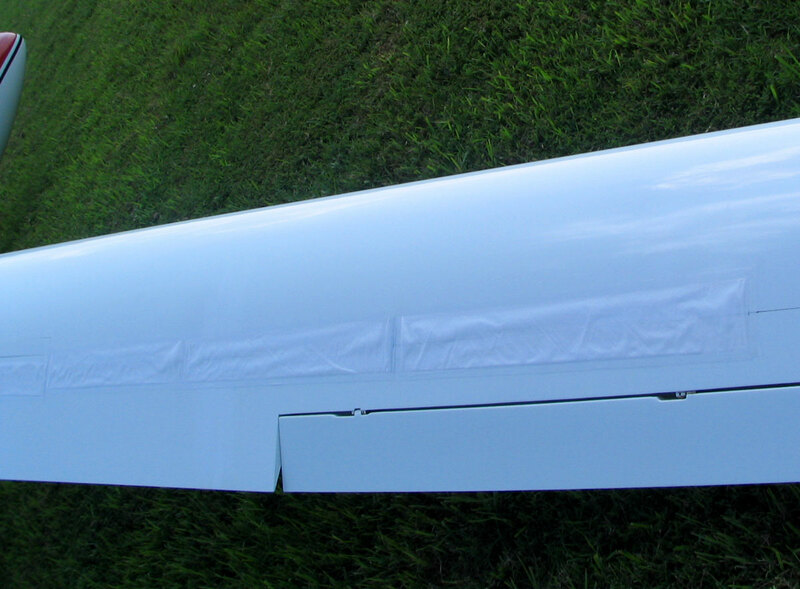 From that point to about 48 inches beyond the inboard end of the ailerons, they were widened by a factor of two (from 2 to 4 inches). As in recent flights, parachute Nylon was used for the skins. The intent of this change was to broaden the narrow performance speed bands to make it easier to hold performance speeds for longer periods. The occurrence of a second instance of extreme performance with precisely the same duration as Johnson's first measurement, although different ventilation schemes were used, suggested that airframe mass/balance, momentum and aerodynamics accounted for the repeating pattern. A sudden onset of increased lift, when the deturbulators began working, upset the balance and induced a reduction in angle-of-attack while the pilot was holding the airspeed constant. The change in AOA caused the flow reattachment point to move away from the deturbulator resulting in a loss of performance. If the pilot were skilled enough, he might be able to allow the airspeed to diminish as he attempted to hold the improved variometer reading and thereby sustain the improved performance, perhaps indefinitely. To make this easier, I considered that widening the deturbulators would allow greater movement of the reattachment point without losing the deturbulation action and thereby make sustaining periods of extreme performance easier. Conditions were not good for performance measurements on this day, so my only objective was to look for repeating indications of improved performance and the ability to sustain periods of improved performance. Of course, any indications would necessarily be subjective because of convection and turbulence in the air below the inversion level. 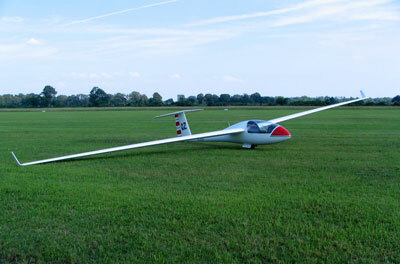 But, the glider was modified and a maiden flight was in order. The temperature was approximately 100 degrees F on the surface and the relative humidity was around 80%. The first thing I noticed was that the fabric was obviously too loose. 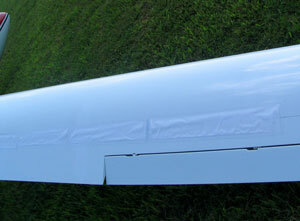 The outer wing sections bent upward enough for me to see the fabric elevated from the surface at low speeds. That can only mean no deturbulator action and additional drag. 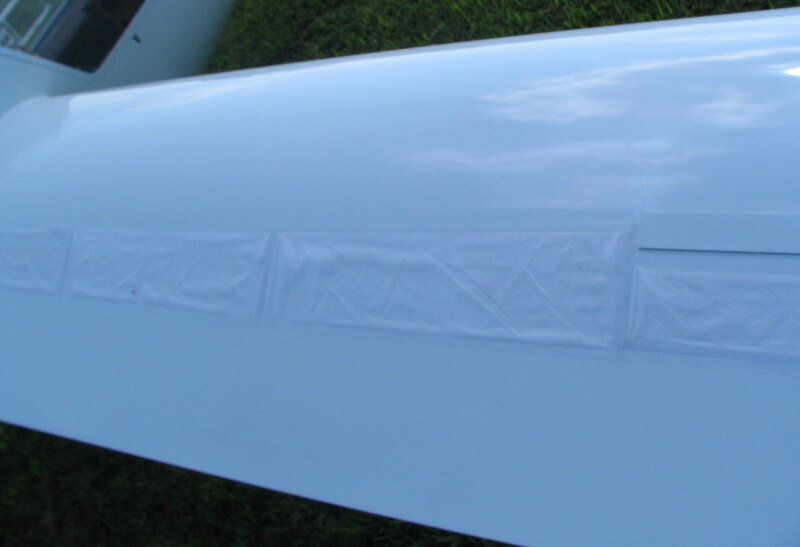 At 60 kts and faster, I saw much less of the fabric. The excessive looseness can be seen clearly in the post-flight images below. Apparently, each first flight causes the parachute Nylon to stretch permanently, making it necessary to tighten it before the next flight. The trick is not to over-tighten it. 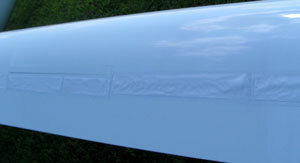 I may resort to splicing a section of elastic membrane onto the trailing edge of the deturbulator skin. This would more or less stabilize the tension on the Nylon as it espands and contracts with changes in humidity, temperature and aerodynamic stresses. The problem is that this may give the whold skin an elastic quality that would change the flow-surface interaction modes. The next thing I noticed came as a surprise. While cruising in smooth air and gradually approaching 60 kts from below, the nose distinctly and smoothly dipped downward by several degrees with no change in airspeed and with an up-swing of the variometer needle. This occurred about three or four times and was sustained for several minutes on one occasion. 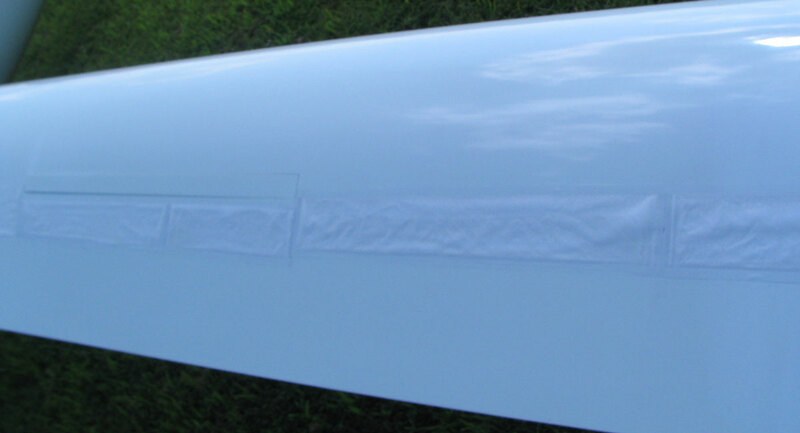 Generally speaking, even though the skins were too loose, the 60 knot (indicated) airspeed could be counted on to give improved performance for long periods of time. On a glide of 9 miles, with an 8 knot quartering tailwind, I experimented with different airspeeds to find the best one. Not surprisingly, 60 knots produced a consistently large gain on the glide slope. No other speed gained on the computed glide slope. With a tailwind component, the best speed should have been lower than 52 kts, not faster. Occasionally, 50 knots seemed to work momentarily, but not reliably or for sustained periods. On an earlier flight with too-tight parachute fabric skins, I noticed a pure tone while flying at 40 kts. It went away at higher speeds. On this flight, I listened again and heard not one tone but multiple tones that came and went, producing a musical quality. I think this indicates that the too-loose skins were permitting numerous flow-surface interaction modes that changed constantly with subtle changes in surface flow velocities. I will record these tones on future flights and frequency analyze them for insight into theoretical flow-surface interaction modes. Another first for this flight was a slight leftward yawing at 60 knots. 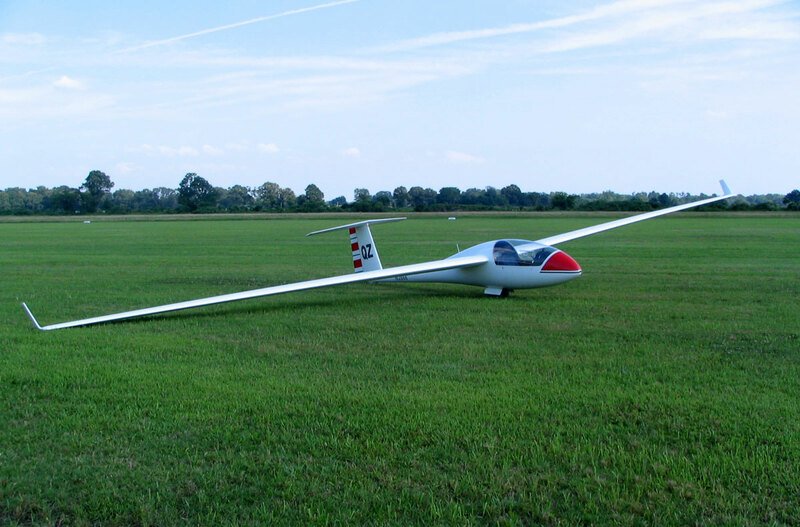 Always in the past, the glider would yaw to the right when holding a performance airspeed. However, this was the first flight with totally new deturbulators since 2007. The chordwise position of these deturbulators was changed slightly. 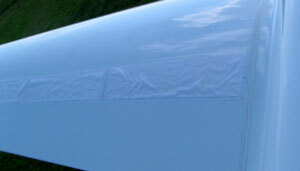 That, or differences in the panel-to-panel skin tension/slack would appear to account for the yawing effect. As with the last flight when the skins were too loose, the stall speed was reduced to 35 kts. This time it gently dropped the right wing instead of the left wing as it is accustomed to doing. Again, this suggests additional turbulence that acts at high AOA to keep the flow attached at the upper tailwind edge of the wing. I am confident that even though the skins were too loose, I witnessed enough instances of 60 kt performance to indicate that at least one airspeed was working reasonably reliably. Also, considering the high humidity, it appears the humidity issue that has plagued us in past years is now behind us. This is further confirmed by the measurements taken in the first surface ventilation performance measurement.